My kids are fascinated by the idea of a new year. “You mean, one day it is one year, and the next day it is another one?” Yep! It’s pretty amazing. I love a the new year, as well. It always feels great to have a fresh start, with new goals to achieve. I am setting a goal to read 100 books in 2019! Are you looking for some great books about New Year’s Day? This list of books about New Year’s Eve and New Year’s Day will help you ring in another year with reading — my favorite way to celebrate any occasion! The Night Before New Year’s by Natasha Wing — I first discovered this series when putting together our Hanukkah book list, and I enjoyed the New Year’s Eve book just as much! The entire family is determined to stay up and ring in the new year, but that gets harder to do as the clock creeps closer to midnight. Shanté Keys and the New Year’s Peas by Gail Piernas-Davenport — Eating black-eyed peas on January 1 was one of my family’s traditions growing up, so I was very excited to see it in a book! Shanté’s grandmother is cooking up a delicious meal for New Year’s Day, but she forgot the black-eyed peas. Shanté goes out in search of some, because she knows it’s bad luck to skip this tasty ritual. New Year’s Eve Thieves by Ron Roy — The Calendar Mysteries follow the younger siblings of the A to Z Mysteries kids, and this series is one of the first my oldest son got into. The kids are excited for a New Year’s Eve party, but they start to see clues that something suspicious might be going on. The perfect choice for early chapter book readers. 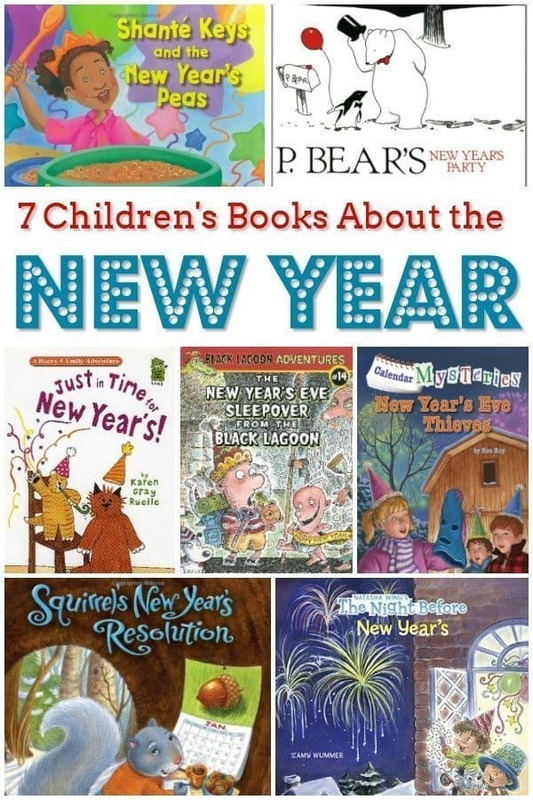 P. Bear’s New Year’s Party by Paul Owen Lewis — The first thing that drew me to this book was the gorgeous black, white, and red illustrations. However it’s also a great story that teaches counting and telling time. It’s a great book for preschoolers, although my second grader loves it, too! Squirrel’s New Year’s Resolution by Pat Miller — Squirrel has heard about New Year’s resolutions, but she’s not quite sure what a resolution is. Squirrel helps her friends with their own resolutions, but she has a hard time choosing her own. Will Squirrel find the right New Year’s resolution to start her year? Just in Time for New Year’s by Karen Gray Ruelle — Harry and Emily really want to stay up until midnight, but it proves to be harder than they thought. Will they be able to keep their eyes open long enough to ring in the New Year? How can these two kitties keep themselves up that late? The New Year’s Eve Sleepover From the Black Lagoon by Mike Thaler — Hubie has been invited to a New Year’s Eve sleepover, but he’s more nervous than excited. He’s never spent the night in a strange place, and he’s worried about what could happen. An excellent choice for kids reading early chapter books! However your family rings in the new year, we hope these books will make your celebration even more fun — whether you make it to midnight or not!